Better, bolder, bigger (inside at least). That’s what Ford is aiming for with this new Focus. It has stiff competition from traditional family hatchbacks like the Vauxhall Astra and VW Golf, more upmarket offerings like the Audi A3, BMW 1 Series, and Mercedes A-Class, and now more than ever, small crossovers like the Peugeot 2008 and Nissan Juke are muscling in on the family hatch segment too. Buyers of family cars have more options than ever, which goes some way to explain why Ford has seven trim levels to choose from with the Focus, with more to come in future. Base specification models start from £18,300 new, mid-range Titanium models cost £21,900, while the most expensive Vignale models will set you back at least £25,800. Different specification levels get different levels of technology, and all cars (except for the basic Style trim) have Ford’s new SYNC 3 entertainment system. The old Focus’ system was archaic, but this new one is much more on trend. It has Android Auto and Apple CarPlay, live mapping data, plus, a swish app-based system that gives you the option of locking or starting your car from your phone, as well as being able to defrost the windscreen remotely. This only works if you, and the car, both have signal. Inside, it’s not just the entertainment system that’s improved. This new Focus uses 50% fewer buttons than previous model. While there are still steering wheel buttons that control the radio, cruise control, and what’s displayed in front of you, the rest of the inside is calm and mostly button-free. Nearly everything is controlled by the 8 inch touchscreen, which is easy to use and easy to read, and the pinch-and-zoom feature on the satnav works much the same way as Google Maps does on your phone. Other tech highlights include level 2 autonomous driving technology like adaptive cruise control that will stop in traffic and get you going again, lane centring that will keep you in a lane, and speed sign recognition that will slow down when it spots that you’ve entered a lower speed limit. These work effortlessly and are controlled via the steering wheel buttons on the left-hand side. It also has a system called Evasive Steering Assist, that can help drivers steer around stopped or slower vehicles to help avoid collisions. This Focus is Ford’s first model in Europe to get a head-up-display too. This option is mounted behind the steering wheel, and projects speed and sat-nav instructions in front of the windscreen. It’s easy to read, but feels cheap and looks like a random piece of plastic Pritt-Stickd into place. Quite a lot of the interior (notably the dashboard and centre console) feels cheap in comparison to other cars in the same ballpark like the VW Golf, Mercedes A-Class, BMW 1 Series, and Audi A3. But the Ford feels better than all of these cars to drive. The Focus is sharp to turn in, with steering that never feels overly light or assisted. The weight of the steering always seems just right, which helps you know exactly what the car is up to. Even the diesel is fun to drive down a winding set of bends. The new six speed manual gearbox feels great in your palm, and is easy to use. The eight-speed auto is smooth and leisurely. There are two different rear-suspension options on the Focus, depending on which spec you choose. The 1.0-litre EcoBoost petrol and 1.5 EcoBlue diesel get non-independent rear-suspension, but the 1.5-litre EcoBoost will get a fully independent set up. The latter is better for overall control, while the former gives you more space in the rear. Will you feel a difference? Probably not. Behind the wheel, you will feel the difference between ST Line and cheaper models. This is because ST Line cars are 10mm lower and have bigger wheels. You’ll feel more vibrations through the seat, and in the steering wheel. It still rides well, and is less fussy than an M Sport spec BMW, but it never feels as settled at motorway speeds than models with smaller wheels. This brings us onto the catch 22 within the Focus range. ST Line cars aren’t as comfortable as others, but they do look better. The Focus, for lack of a better phrase, has a blobby side profile. From the front there’s an air of Mazda2 about it, and from the rear there’s a definite hint of Mercedes A-Class. ST Line models have larger wheels and a neat rear spoiler, which help sharpen up the looks and make it seem less podgy. But of course, if comfort is king for you, you just might have to put up with the slightly blobby looks. This is a mere foible in an otherwise well sorted effort that out-performs nearly every other car in its class. It’s not ground-breaking the like the original Focus, but it is just as easy to recommend. There are no surprises here - the lowest powered diesel engine with the manual gearbox, is on paper at least, the most economical. The official combined rating is 80.7mpg. Families who don’t do a lot of motorway mileage won’t really benefit from the diesel. So the 1.0-litre petrol, will probably be the best bet. We’d recommend it with the most power (123hp) as it would prove to be a bit weedy if used in its least powerful form with a car full of kit and kids. The most powerful variant will crack 0-62mph in 8.3 seconds, although it isn’t actually available until November. Warm ST models are due in the summer of 2019, while hot RS models are in the pipeline too. September 2018 New Ford Focus hits dealerships with 1.0 EcoBoost petrol and 1.5 EcoBlue diesel engines. November 2018 1.5 EcoBoost petrol engine and 2.0 EcoBlue diesel engine, plus all Vignale and estate models arrive in dealerships. Late 2018 Focus Active models (with raised ride height and plastic cladding) arrive in the UK. Summer 2019 Ford Focus ST goes on sale, sporting a 276bhp petrol engine, or a 187bhp diesel engine. From the launch there are only two engines available. The 1.0 EcoBoost petrol (available in two power outputs) and the 1.5 EcoBlue diesel (in two power outputs). Ford is offering seven trim levels with the new Focus. Titanium is mid-spec and has nearly everything most people would want. There are two gearbox options, a six-speed manual and an eight-speed automatic. The Focus is currently available with five engines; three petrols, and two diesels. Each one of the engines comes in different power outputs. The 1.0 EcoBoost is available with three different power options. The least powerful is the cheapest and the slowest. It also has a combined fuel rating (with the manual gearbox) that is poorer than the second most powerful engine, and on par with the most powerful version. This makes it hard to recommend. The mid-spec option is ok for town driving, but if you regularly venture out of town you’ll want the most powerful 1.0 EcoBoost engine. This offers virtually identical fuel economy figures to the less powerful versions, but doesn’t ever feel too slow. The 1.5 EcoBoost comes with two power outputs, both of which are quicker and smoother than any of the 1.0 EcoBoost engines. The most powerful 1.5 is usefully quick (a 0-62mph time of 8.3 seconds is more than respectable) and it’s not all that less economical (less than 2mpg difference) than the less powerful 1.5. The more powerful 1.5 EcoBoost is around £2,000 more expensive than the slower version however. The 1.5 EcoBlue diesel is the the big-seller for big-mileage drivers. It feels fast enough to keep up with motorway traffic, but is noisier and less keen to rev than petrol models. A hot-hatch ST version has recently been added to the lineup. It’s available with a 2.3 EcoBoost petrol engine with 276hp on tap. Unusually for a hot hatch, it'll also be available with a 187bhp 2.0-litre diesel engine, baged as 2.0 EcoBlue. These versions are due in summer 2019, and prices are yet to be announced. Style is the base trim, although it isn’t missing out on too much. There’s DAB, alloy wheels, LED daytime running lights and automatic headlights too. Zetec adds Ford’s Quickclear heated windscreen, which clears windscreens of ice easily and quickly in the cold. You'll find cruise control, leather trim on the steering wheel and armrest, plus it gets Ford’s SYNC 3 entertainment system with Android Auto and Apple CarPlay. ST-Line cars get sportier looking bumpers, larger alloy wheels, keyless start, and a sporty flat-bottomed steering wheel. Next up is ST-Line X. This gets a bigger entertainment screen and bigger alloy wheels, as well as privacy glass, front and rear facing cameras and electric folding door mirrors. Titanium cars are supposed to be less sporty than ST-Line models, but with similar kit. These cars get rain-sensing wipers, parking sensors, and the big entertainment screen, but smaller alloy wheels. Titanium X brings electric adjustment on the driver’s seat, part leather upholstery, and 17 inch alloy wheels (bigger than Titanium, not as big as ST-Line X). The poshest and most expensive (for now) models are called Vignale. These get 18in alloy wheels, full leather seats, a Bang & Olufsen stereo, plus, the added bonus of better customer service from Ford dealers. This includes a free washdown (for the car) at the dealer. The fastest version of the Ford Focus, until the RS comes out, is the ST. You can read more about the engines found in the ST in the engine section above, but ST cars also get cosmetic tweaks. It sits 10mm lower, has bespoke Michelin tyres, plus there’s also a new bodykit, and twin exhausts. The new Focus was brand-new for 2018, and came out too late to be considered for the 2018 Auto Express Driver Power survey. The previous generation Ford Focus placed 33rd out of 75 in Auto Express’ Driver Power Survey for 2018. Owners liked the engine, and the way it handled, but felt its boot was sub-par. Only 5.7% of owners said it had gone wrong - remarkable for a top-selling car. The three-year/60,000 miles warranty is standard Ford affair, and looks small compared to Kia’s seven year warranty and Hyundai’s five year warranty. Several other manufacturers, like Mercedes, offer three years, but with unlimited miles attached to them. The Focus has only just gone on sale, so don’t expect to find many on the used market just yet. 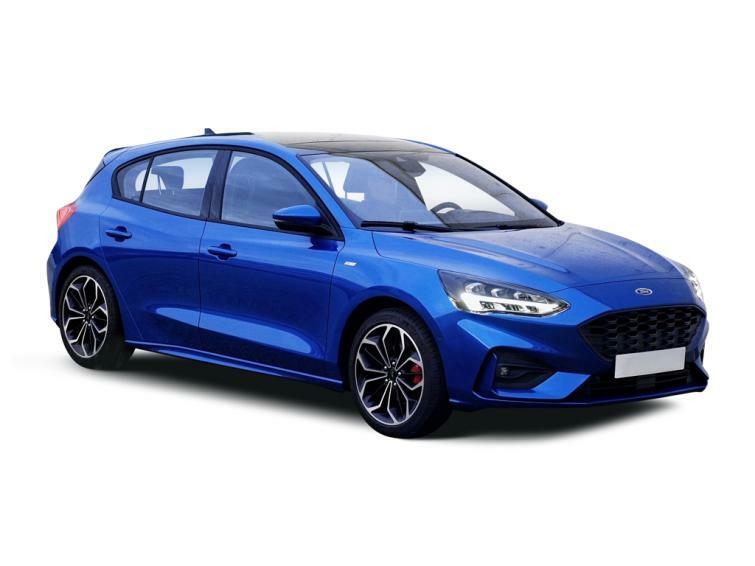 There are currently 6 Ford Focus' available on BuyaCar, with prices ranging from £17,490 to £26,980 for nearly-new models. Don’t expect to find too many diesels, even after it's been on sale for a year or two. Ford reckons only 27% of Focus' will sip from the black pump. Ford also predicts that the poshest spec Vignale cars will only make up about 4% of sales. So don’t expect to find many of those either. The Ford's 375-litre boot is slightly smaller than the Volkswagen Golf's when the seats are up, but slightly larger (1,354 litres) when the seats are folded.